Wudang Kung Fu is combined with Jinluo theory in traditional Chinese medicine, with the internal exercises as the core. It is daintily about the combination of mind and body, to improve the metabolism and adjust the Yin and Yang, also to smooth Jingluo, so as to achieve the aims of the life enhancement, benefiting one's wit and keeping longevity. 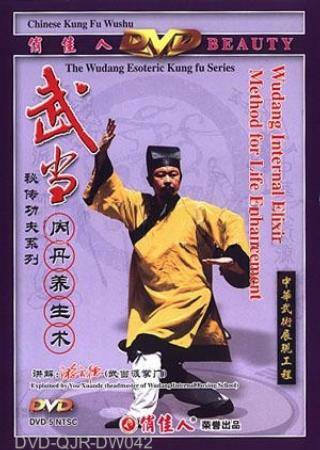 This method not only incarnates "the performing wushu via doctrine", but also "displaying Wushu via doctrine". The source of Wudang Kung fu is based on the inaction, rooted in stake, move like a snake walking, calm as a mountain. This is a required course for the Taoist disciples. Due to the development of the history and the different teachers, so form the different systems of south & north five originators. Though they lay special emphasis on different skills, but the tenet is coherent. "Long- living & long- staring " is the same aim for every refiner. In the wushu circle, there is a saying that "if only practicing boxing but not kung fu, you will be all in vain when you are old". It is obvious that it is important to practice the Internal Elixir Methods for Life Enhancement.